I cooked something! Well, kind of. A few weeks ago my sister Caitlin and I shared a slice of pie very similar to this when out for dinner together. We both loved it, she challenged me to make my own version, and I did. Long story short. This is a perfect dessert for a variety of reasons. First of all, it has fruit. This helps you trick yourself into feeling healthier than you are. Number two: It’s light, which means if you already ate supper, you can still cram in a few bites of pie and not feel totally gluttonous. Thirdly, it’s easy! I’m scared of real pie crust so an Oreo one is right up my alley. I even venture to guess that you could skip baking the crust, although it may not slice as easily. No oven=perfect summer dessert. Fourth: it has two kinds of chocolate. And caramel. And whipped cream. Don’t you just want to face plant into that slice?! Preheat oven to 350 degrees and grease a square baking dish. Melt the butter and stir in the Oreo crumbs to make a paste. Press into the prepared baking dish and bake for 8-10 minutes or until the crust is starting to set. Let cool. Once the crust is totally cool, drizzle the Dulce de leche over the crust. Slice the bananas into coins and spread them evenly over the Dulce de leche. Pour the whipping cream, powdered sugar and vanilla into a bowl and beat on high speed until stiff peaks form. 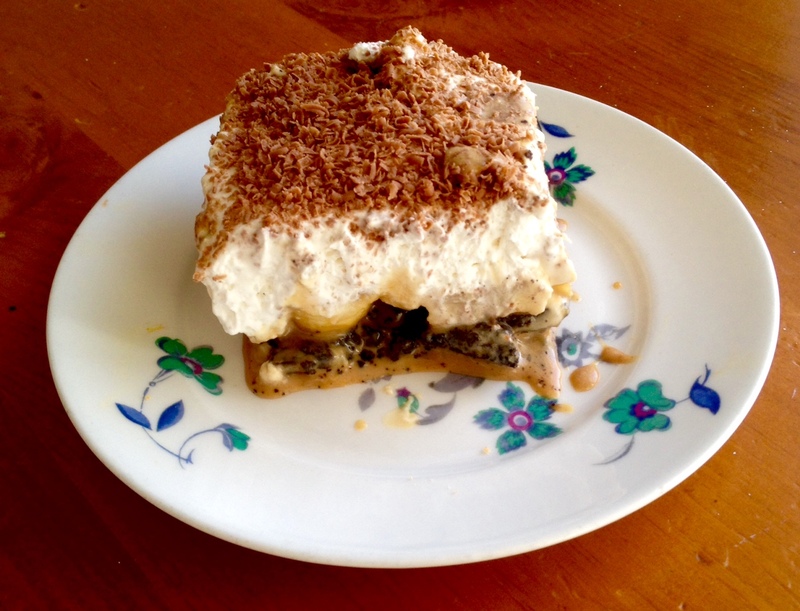 Spread the whipped cream over the sliced bananas. Grate the chocolate bar over top the whipped cream. Chill the pie until ready to serve. Drizzle pie slices with extra Dulce de leche before serving if desired . Chill the bowl and beaters before making your whipped cream. It whips faster and stays stiff longer. This pie can be made the day before serving. Once you cut into it the caramel oozes out though, so best to serve it all in one sitting or it can be a bit messy (but still good!). Thank you! I will definitely take a peek!